Where flora, fauna and flavor collide. 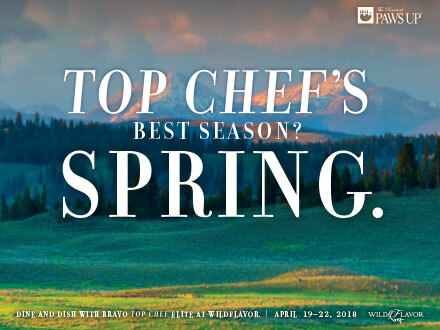 Join us at The Resort at Paws Up for our second WildFlavor event, featuring the cream-of-the-crop in culinary talent. This foodie weekend will feature four Top Chef stars, including Sam Talbot (finalist, Season 2) Casey Thompson (finalist, Season 3) and the 2017 champion, Brooke Williamson (winner, Season 14). Guests will be able to whet their appetites throughout the weekend and watch these chefs “fork it out” during a live cook-off challenge. Of course, expertly crafted meals will be served throughout this delicious four-day event. Don’t forget to toast with exquisitely paired fine vino, compliments of Melville Winery. Or wet your whistle with something from Harumph Wines or Montgomery Distillery. Along with plenty of available wilderness activities to burn off those calories, WildFlavor is the perfect blend of food and fun this spring at The Resort at Paws Up. Spend a weekend with the cream-of-the-crop in culinary talent at The Resort at Paws Up.